(Real Farmacy) Meet 92 year old, Aurora Leveroni, aka ‘Nonna Marijuana’—the Italian medicinal weed chef from northern California. Aurora knows that food is medicine She has a backyard farmacy where she grows various strains of marijuana, which she uses in all her edibles. She runs a genuine mom and pop, garden to table medical marijuana operation. “Hearty chicken cacciatore gets turnt up with onions, cremini mushrooms, black and green olives, a dash of wine, and weed.” (2) Here’s the recipe. 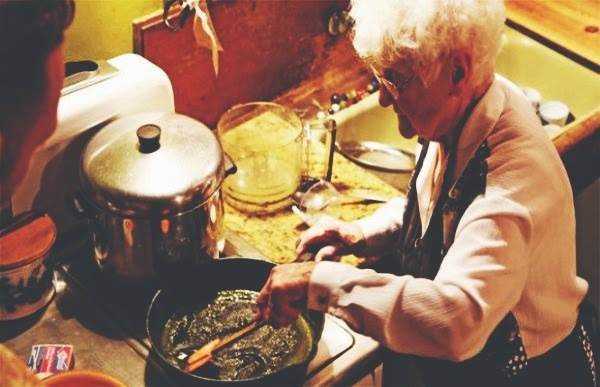 What prompted Nonna to start cooking with marijuana? Although without a doubt her Italian heritage instilled a love of fresh, wholesome food made with love and skill from scratch, it was her daughter Valerie who first introduced her to the idea of combining cannabis and food to create a potent, edible medicine. You see, Valerie suffered from debilitating, epileptic seizures, and as a result was taking a variety of toxic, side-effect laden pharmaceuticals that weren’t really working. While desperately seeking out alternative treatment protocols, Valerie discovered that marijuana is a clinically proven and effective holistic medicine that routinely eliminates seizures without the devastating side-effects of Big Pharma drugs. After thoroughly researching cannabis as a seizure control option, Valarie began self-medicating with marijuana. Within a very short time, she was able to ditch all Big Pharma drugs and effectively manage her seizures exclusively with marijuana. Nonna not only fully supported her daughter’s use of medical marijuana, she became a medical marijuana advocate for all patients who could benefit from using it. In fact, Valerie is one of the founders of WAAM (Women/Mens Alliance for Medical Marijuana), a cutting edge group that spearheaded the use of medical marijuana for chronically ill and terminal patients located in Santa Cruz, California. Incredibly, WAAM dispenses organically grown, medical marijuana to qualifying patients and their caregivers on a donation basis. This is the first in a series of “how to” You Tube videos Nonna agreed to do for Bong Appetit, a new MUNCHIES show focused on cannabis and cuisine. The focus is on teaching medical marijuana patients, via a visual step by step cooking demonstration, the basics of successfully infusing medical marijuana into food.